I’m excited to tell you all the reasons why Milio’s is such a unique business opportunity. Of course, I’m biased; this company has been my passion for almost three decades. I can lay out everything you need to know about the business model, from the proven systems to the marketing tools and massive support structure. But there’s another piece to the Milio’s Sandwiches puzzle that I want to tell you about first: our customers. I’ve met thousands of Milio’s customers over the years and their loyalty still amazes me. Many know the menu by heart. They order their sandwiches by numbers. They eat here at all hours, from lunch to late-night. Sometimes they come to us; sometimes we go to them. They know our staff and delivery drivers by name. They support our causes. And time and again, they rave about our food. Owning a successful business is rewarding enough, but when the customers become part of your family, a whole new level of pride and satisfaction comes into play. I have no doubt that we can create that same experience for you. Milio’s Sandwiches franchise team are a group of strong leaders dedicated to helping our franchise owners grow their business and create a great place to work. With over 80 years of combined experience in the restaurant industry, the Milio’s franchise team is passionate and committed to successful business practices. They know what it takes to run a thriving franchise and have the credentials to prove it. Milio’s Sandwiches’ mission is to build strategic and operational partnerships with our franchisees; we seek a relationship built on mutual respect, trust and transparency. We are committed with our franchisees, to providing the great food and great service that our guests expect as part of the Milio’s Sandwiches experience. As part of the Milio’s family, we treat your investment in our franchise with the same care and dedication as our own. From food costs to vendors, we work hard to have the best pricing for our franchisees so we are able to keep our start-up costs low. There’s a reason that the business cliché, “Location, Location, Location,” has been around for a long time – because it’s true. With 35 locations and growing, Milio’s can offer prime locations for whatever format you like in small or large markets. Milio’s has spent over 29 years perfecting our craft of making the best sandwiches on the freshest bread, baked every 4 hours, every day, at every store! 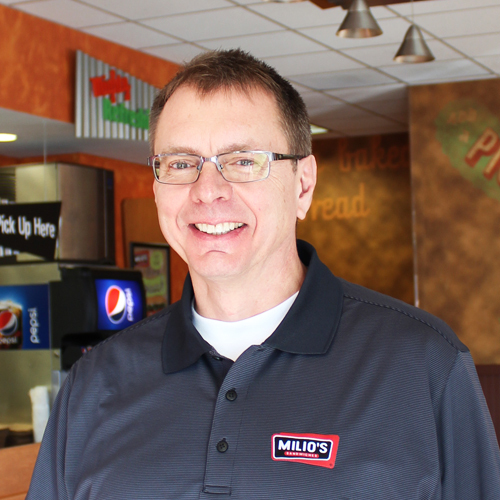 Every franchisee who joins our family receives our many years of experience to help your Milio’s grow! We keep things pretty simple at Milio’s, make a great sandwich for your customer and set high standards of quality. We want to make this process as painless as possible and fun! After all, we want the same thing: to make you and your store successful! Milio’s believes in supporting our franchise owners in all aspects of growing their business. We’ve developed a comprehensive training program that will assist you from the start of the process, through your Grand Opening and long after you open! Owning and operating a Milio’s Sandwiches franchise allows you the freedom and flexibility to be your own boss, to make business decisions and to be part of your local community. You are in charge here, so why not benefit directly from your hard work? 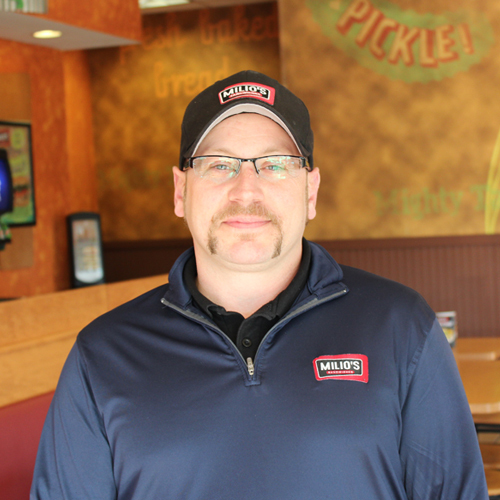 "I started working at Milio's in 1991 at the original Big Mike's Super Subs, I knew then that my goal was ownership. 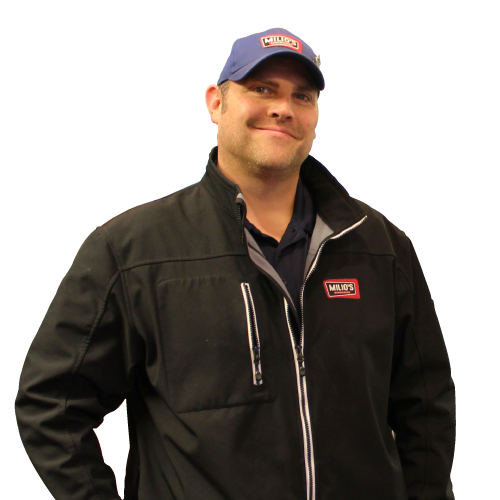 As a franchise owner I have the opportunity to see my hard work grow into something and I believe passion and heart are the keys to my success." 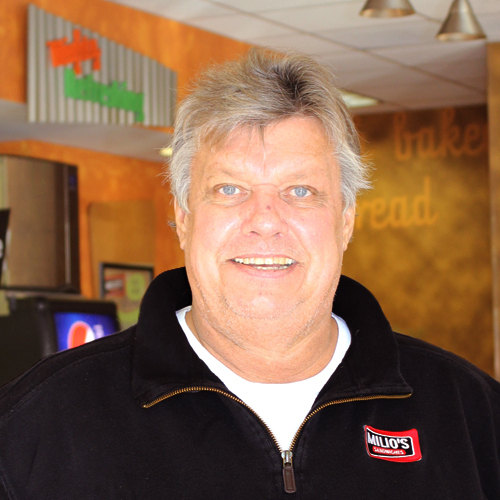 "I researched several businesses and chose Milio's because of their community involvement. It's more than sandwiches, it's the relationship we build with the community and our customers." When you are a Franchise Owner of Milio’s Sandwiches – you are part of our family! We’re passionate about delivering the freshest bread, the highest quality ingredients, and outstanding customer service – and likewise we are also passionate and selective about our franchisee partnerships. We’re looking for ambitious individuals with an entrepreneur spirit to meet the challenging demands of the foodservice business head on. The best Franchisees share our passion for delivering great quality food and service. Take a look at the information below and if it sounds like you – let’s talk. to build a quality business you’ll be proud to own? to work hard, have fun and spread the Milio’s love? to lead and build teams? to serve and support your local community? a love of food, more importantly, sandwiches? a hunger to grow business? a high level of energy? strong drive & commitment to succeed? passion for excellent customer service? the ability to train, motivate, inspire, and develop a team? When you buy a Milio’s Sandwiches franchise, you buy the Milio’s franchise rights and are responsible for all day-to-day operations and their cost. The Milio’s franchise team will support you from start to finish with location selection, construction, operations, training and advertising, as well as provide ongoing support. Milio’s offers a variety of restaurant formats that thrive in different venues. We currently work within three different store formats and all formats can potentially include a drive-thru and indoor & outdoor seating options. Locations can be new construction or conversions (convert existing restaurant or commercial space). This counter-service model does well in convenience stores and gas stations where foot traffic is high. It’s the same great Milio’s Sandwiches, but with a much smaller footprint! This model typically does not include Milio’s design aspects and branding which are found in stand-alone and in-line locations. Milio’s Sandwiches end-cap and in-line units in commercial and retail spaces are great for conversion builds. This model doesn’t typically feature exterior design elements like stand-alone locations and will share parking lots. They are great for high-traffic venues with extended dwell time. Freestanding Milio’s Sandwiches locations are great for visibility and for locations with heavy road traffic. 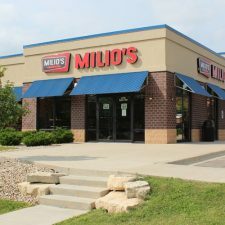 This model typically includes a Milio’s branded building, canopies and a dedicated parking lot and are suited for a drive-thru as well as indoor and outdoor dining. 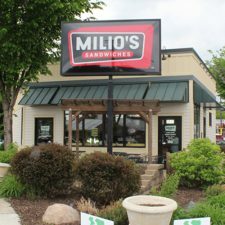 With 35 locations and counting, Milio’s Sandwiches is growing! We currently have locations in Wisconsin, Iowa, and Minnesota and will continue to focus on growing the Midwest market. We have franchise locations available in large cities as well as smaller towns. Chances are if we’re not in your neighborhood now – we want to be! There’s a lot of moving parts with owning a Milio’s Sandwiches franchise, the initial investment may vary depending on several factors such as property condition, construction, landlords, geographic regions and more. 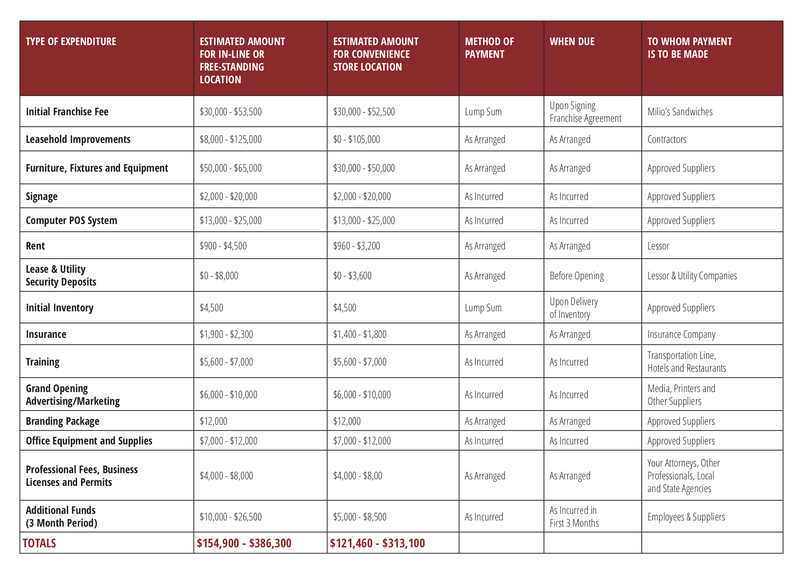 Here is what a breakdown of the estimated initial investment for developing a Milio’s franchise could look like. 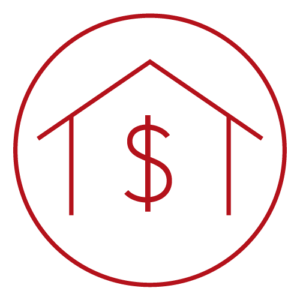 *Your initial investment may vary depending on numerous factors, including the condition and square footage of the premises, the amount of construction performed by the landlord, impact fees, geographic areas and your capabilities. Milio’s Sandwiches franchise development team will work with you from start to finish on the development, beginning with the initial paperwork to your store opening. 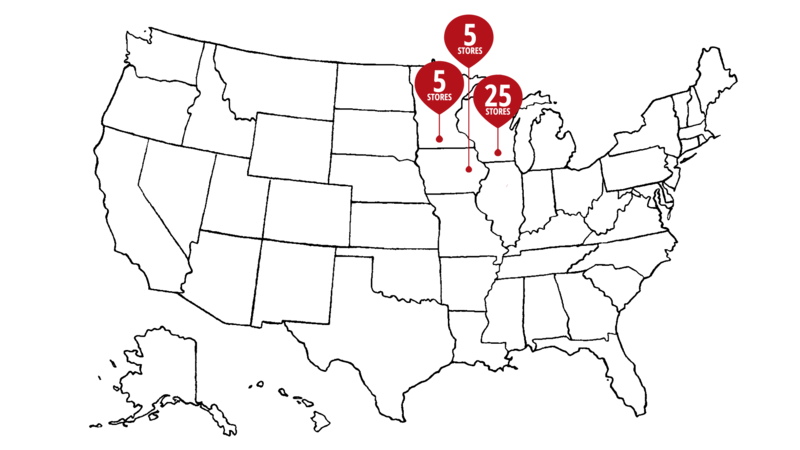 While the length of the process varies by location, you can expect around 6 months. 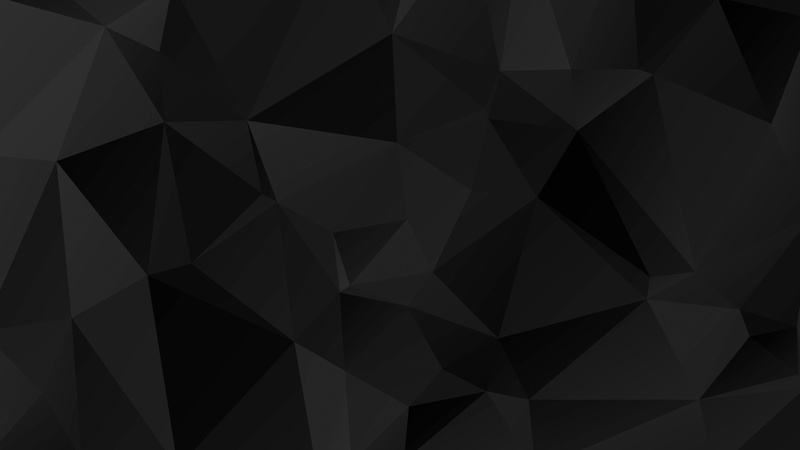 Take a look at our website and if you like what you see, we should chat! If you think you’d make a great fit, email the Founder and President, Mike Liautuad, at mike@milios.com so we can get to know you. We’ll get to know each other a little more on a phone call and if you’re ready to move forward, the next step is to complete our official Milio’s Franchise Application. You can find it here. Milio’s will review your franchise application and conduct interviews with you. If everything checks out and you decide that the way we do business is the way you can do business, then we’ll make it official! Once legal has dotted their i’s and crossed their t’s, you’ll be ready to rock n’ roll with our franchise team. The first thing you’ll do is come hang out with us in Madison, Wisconsin! All your employees have been hired and you have completed all your training. Let’s celebrate and bust out the champagne! You’re ready for your Milio’s Sandwiches Grand Opening! What will I receive as part of the Milio’s Sandwiches Franchisee Program? As a part of the Milio’s Franchisee Family, you’ll receive a designated franchise delivery area, initial training and ongoing support, advice and recommendation on site selection, on-site startup assistance, marketing assistance, detailed operations manuals and more! Who is an ideal Milio's Sandwiches Franchisee? Milio’s ‘Ideal Operator’ is an ambitious individual with an entrepreneur spirit to meet the challenging demands of the foodservice business head on! The best Franchisees share our passion for delivering great quality food and stellar customer service. We want people who want to build a quality business that you’ll be proud to own, who want to work hard and have fun, someone who wants tremendous opportunity, wants to lead and build teams, and finally, someone who wants to serve and support your local community. Does this sound like you? Email our Founder and President, Mike Liautuad, at mike@milios.com for more information or submit your franchise application! Is prior restaurant experience necessary in order to become a Milio’s Sandwiches Franchisee? No experience in the sandwich or quick service restaurant field is required for single franchise locations, but it’s certainly helpful. We’re more interested in your drive, passion, and desire to grow a business. If you’re interested in opening a multi-unit franchise, you may be required to have prior restaurant experience. Of course, you’ll need to love sandwiches! How much is the Milio’s Sandwiches franchise fee? The franchise fee is $30,000. How much does it cost to open a Milio’s Sandwiches Franchise? The initial investment to open a Milio’s depends on the type of location. Assuming that the land and building are leased spaces, you can expect $121,460 – $313,100 for convenience store locations and $154,900-$386,300 for in-line or stand-alone locations. Both estimates include the initial franchise fee of $30,000. What are the royalty and advertising fees? Milio’s Sandwiches franchisees pay 6% of net sales to franchise royalties and 3.5% of net sales for system-wide marketing and promotional efforts. Unfortunately, Milio’s Sandwiches is restricted from providing you with an estimated profit figure due to regulations from the Federal Trade Commission and various state regulating franchise sales activity. Milio’s Sandwiches does not offer financing at this time. What training will I receive as a Milio's Sandwiches Franchisee? We want you to be a Milio’s Sandwiches smarty-pants. Before you open or acquire your first franchise location, you will complete our 4-6 week training program which consists of both classroom hours and on-the-job training. After your location is up and running, you’ll work directly with the Director of Franchise, who’ll be your go-to support for topics such as operations, management, training, advertising, reporting, personnel management and more on an ongoing basis. What type of ongoing support does Milio's provide to Franchisees? After you’ve opened your new location, Milio’s Sandwiches will offer ongoing support in all aspects to help grow your business. This includes periodic visits from our Franchise, Operations, Training and Marketing teams. You’ll also work directly with the Director of Franchise, who will provide ongoing guidance, support and answer any questions you may have along the way. Additionally, we’ll keep you up to date with new procedures and other information to keep you at the cutting edge of the restaurant industry. Our team is always is an email or phone call away! What are the terms of a Milio’s Sandwiches franchise agreement? Typically, the term of a Milio’s Sandwiches Franchise Agreement is 10 years. The franchise agreement is renewable for two (2) subsequent – five-year terms. The first step is completing our Franchise Application. After reviewing your information, we’ll contact qualified applicants. Can I franchise a single Milio’s location? Yes, however, if you are in a new market you may be required to develop 3 or more restaurants. Can I own more than one Milio’s location? Absolutely! You can own more than a single Milio’s location. To do this, you would sign a development agreement for multiple units to lock-in additional locations. I have a great real estate site for a Milio’s Sandwiches location but I don’t meet your franchise criteria. Who should I contact? For individual real estate considerations, please contact Mike Liautaud, Founder, and President at mike@milios.com. How do I find a great Milio’s Sandwiches location? Once you become a Milio’s Sandwiches franchisee, our team will assist you with using our proprietary site selection process. 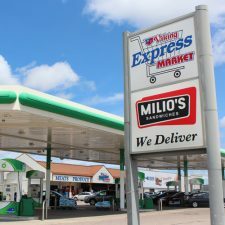 The Director of Franchise will make a recommendation on whether a location should be approved or not, with the assistance of the Milio’s Sandwiches Founder and President. You will negotiate the lease with the landlord directly with our guidance. How many employees does it take to operate a Milio’s? It depends on sales volume and location, but we would suggest anywhere from 10 to 15 full and part-time Milio’s employees. Do I need to live in the same market where I operate my Milio’s restaurant? Yes, you must reside in your area to effectively manage your Milio’s Sandwiches location(s). I’m ready to get started! How long does the franchise process take? We’re glad to hear that you’re ready to get the ball rolling! The franchise process can be different for every person, but the typical time from the time you sign the Milio’s Franchise Agreement to opening your business is around 6 months. Ready to take the leap into owning a Milio’s Sandwich franchise? Let us know a little more about your interest by filling out our Franchise Application. 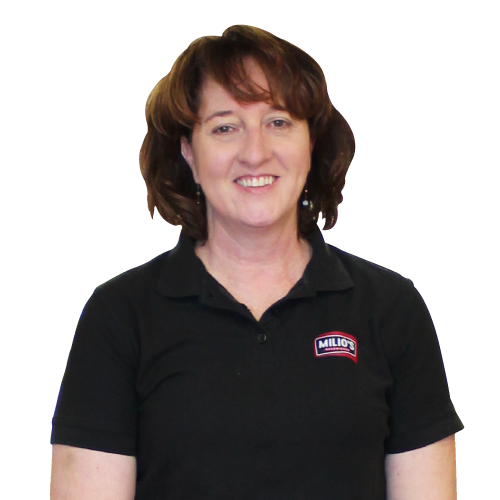 Our Franchise Team will review and follow up with qualified applicants.